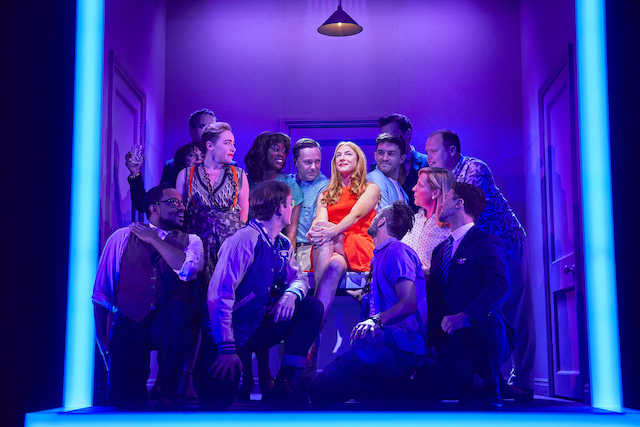 If Stephen Sondheim’s original show Company was credited with reinventing the musical, the redux from director Marianne Elliot and producer Chris Harper that has just opened in the West End’s Gielgud Theatre is a true reinvention of the show. There are gender role reversals and contemporary references that add a freshness with the lead being a relatable Bridget Jones in Manhattan, yet the Sondheim magic is still beating firmly at this production’s heart. Bobbie is in her mid 30s and is at odds with enjoying her single life and with her friends and their seemingly perfect coupled lives. Her biological clock is ticking quite loudly as she spends time with these couples and sees their superficially happy relationships implode and deconstruct. When she examines her current dalliances, there is a magnificent version of “You Could Drive A Person Crazy” where the three men Bobbie is dating take centre stage like a male Bananarama. As the friends tighten the screws in Bobbie’s mind, we are witness to some inspired and downright hilarious set pieces, culminating in a divine and emotional rendition of “Being Alive” by our protagonist. The ensemble cast is a delight. The jujitsu scene featuring a glorious Mel Giedroyc and her doughy husband Gavin Spokes is fantastic. Richard Fleeshman is wonderfully daft in an intelligent and cute turn as one of Bobbie’s boyfriends, Andy, a limited airline steward; the song “Barcelona” finds his voice and his comic chops on fine form. There’s a brilliant and thumping nightclub scene precursing Joanne’s finest hour. Patti Lupone in the role of Joanne essentially plays herself in the show, a diva who feels she can be shady because her talent, or in this case her money, allows her to snide and snap. One might suggest that this is hardly a stretch for her, yet it is still deliciously wonderful to see her swill back her vodka stinger while she scowls through the lines of “The Ladies Who Lunch” like a hangover unravelling. The delirious Jonathan Bailey boils over brilliantly in the arduous and hysterical number “Not Getting Married Today” in what is a true standout vignette. Rosalie Craig is a revelation as Bobbie. Her presence is unwavering and real and there is an aching tenderness to her beautiful voice that will take hold of you tightly. Bunny Christie’s set design is purposefully minimalist, so much so that you feel like you’re inside Bobbie’s head. Changes of scale on the set like the ever expanding birthday balloons lend a curious Alice In Wonderland lens, perhaps reinforced by the exasperating “Tick Tock” routine where we see different versions of Bobbie, pregnant, repetitive and mundane. Liam Steel’s magnificent choreography is scintillating here and throughout, and the orchestra above the stage commanded by Joel Fram is outstanding. By the time showstopper “Being Alive” is belted out exultantly at the close of the show, we have to agree, as the candles are blown out on the birthday cake and after spending a few hours in this Company, we are invigorated and hopeful. We have truly been through the gamut, A to Z. A must-see. Brilliant. Nick has a broad and eclectic taste in music and film and this enables him to draw in a wide range of references.